Performance-related pay will be introduced this September. Introduce Performance Related Pay eBook will inform you of all the changes and prompt you to consider all the implications of the change in your own context. What is an eBook? An eBook is electronic version of a printed book which can be read on a computer or a specifically designed handheld device. This eBook is in PDF format and can be shared with your colleagues. make long-term plans for the financial implications brought about by the changes. Explaining key education policy changes in straightforward terms. Outlining what the changes mean for you, your staff and your school. Giving guidance as to what you need to do as a result of the changes. Providing accompanying resources such as templates or proformas for you to adapt and use in your organisation. Keeping it brief – at around 40 pages you can read the guide in an evening and be ready to take action. Using an e-book format – read it any time, any place and easily share with colleagues by posting the guide on your school intranet or printing copies for the staff room. ensure your systems and procedures are fair, robust and in line with the new arrangements. handouts and proformas to help with reviewing your policies, thinking about the questions you need to ask, briefing your governors and staff. What is performance-related pay as proposed? How does what is suggested differ from current guidelines? Understand the proposed new system and what is new. What do the changes mean for your school? 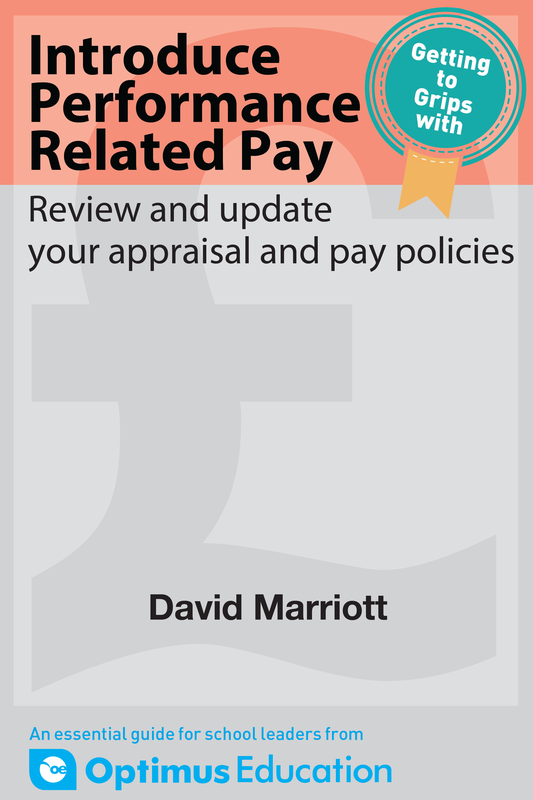 Consider how closely appraisal is already linked to pay progression in your school. Think about the possible opportunities and threats presented by the changes. Plan how you will manage the new system in a fair, robust and transparent way. What will be the long-term financial implications of change? Identify the criteria you will use to award pay increases. Ensure consistency of approach across all staff. Consider likely impact on staff recruitment, retention and CPD. Identify the key questions you and your governors should be asking. What else could you do to reward teachers? Think more broadly about teacher recruitment, retention and wellbeing and what other factors you might use to motivate staff. Books and training products: Titles in stock will be fulfilled within 15 working days. If you have pre-ordered a forthcoming title, you will receive it as soon as it is available. Drag the 'My eBooks' module down to your dashboard. You can now view and access all purchased ebooks from this block. If you can not see your order please email customer.services@optimus-education.com.